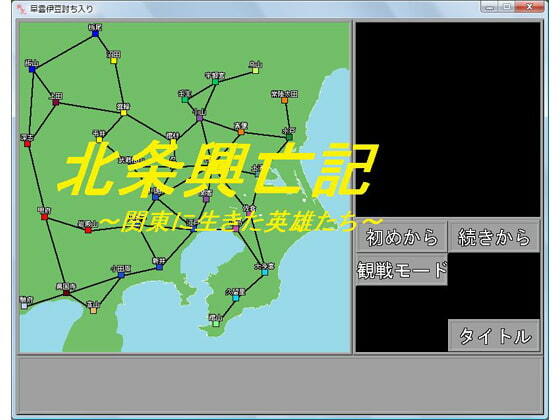 This is a battle sim that chronicles the influence of the Hojo clan in Old Japan. It focuses on the region now known as Kanagawa Prefecture, and covers the clan's rise, highest peak, and decline. However, the battles you fight are not historical recreations. Tactics matter! Give it your best. There are also some famous events besides Hojo clan battles. This is the + Edition of the game. Enjoy the trial but please be aware that artwork in the + Edition it's all completely different. Created with Sky's WarRan Simulation Maker. No download required.